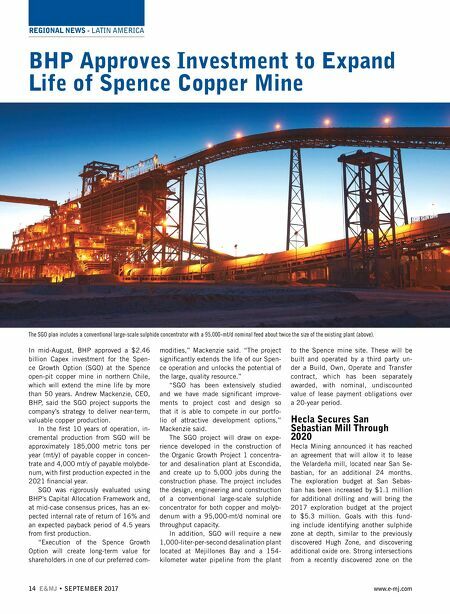 REGIONAL NEWS - LATIN AMERICA 14 E&MJ • SEPTEMBER 2017 www.e-mj.com BHP Approves Investment to Expand Life of Spence Copper Mine In mid-August, BHP approved a $2.46 billion Capex investment for the Spen- ce Growth Option (SGO) at the Spence open-pit copper mine in northern Chile, which will extend the mine life by more than 50 years. Andrew Mackenzie, CEO, BHP, said the SGO project supports the company's strategy to deliver near-term, valuable copper production. In the fi rst 10 years of operation, in- cremental production from SGO will be approximately 185,000 metric tons per year (mt/y) of payable copper in concen- trate and 4,000 mt/y of payable molybde- num, with fi rst production expected in the 2021 fi nancial year. 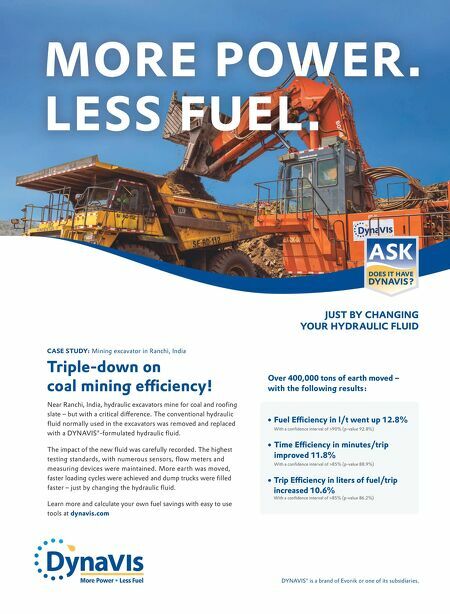 SGO was rigorously evaluated using BHP's Capital Allocation Framework and, at mid-case consensus prices, has an ex- pected internal rate of return of 16% and an expected payback period of 4.5 years from fi rst production. "Execution of the Spence Growth Option will create long-term value for shareholders in one of our preferred com- modities," Mackenzie said. "The project signifi cantly extends the life of our Spen- ce operation and unlocks the potential of the large, quality resource." "SGO has been extensively studied and we have made signifi cant improve- ments to project cost and design so that it is able to compete in our portfo- lio of attractive development options," Mackenzie said. The SGO project will draw on expe- rience developed in the construction of the Organic Growth Project 1 concentra- tor and desalination plant at Escondida, and create up to 5,000 jobs during the construction phase. The project includes the design, engineering and construction of a conventional large-scale sulphide concentrator for both copper and molyb- denum with a 95,000-mt/d nominal ore throughput capacity. In addition, SGO will require a new 1,000-liter-per-second desalination plant located at Mejillones Bay and a 154- kilometer water pipeline from the plant to the Spence mine site. These will be built and operated by a third party un- der a Build, Own, Operate and Transfer contract, which has been separately awarded, with nominal, undiscounted value of lease payment obligations over a 20-year period. Hecla Secures San Sebastian Mill Through 2020 Hecla Mining announced it has reached an agreement that will allow it to lease the Velardeña mill, located near San Se- bastian, for an additional 24 months. The exploration budget at San Sebas- tian has been increased by $1.1 million for additional drilling and will bring the 2017 exploration budget at the project to $5.3 million. Goals with this fund- ing include identifying another sulphide zone at depth, similar to the previously discovered Hugh Zone, and discovering additional oxide ore. Strong intersections from a recently discovered zone on the The SGO plan includes a conventional large-scale sulphide concentrator with a 95,000-mt/d nominal feed about twice the size of the existing plant (above).